Sailing at Clayton Hill Country Park. Enter Postcode EN9 2HX into your SatNav. This should take you to Nazeing Road from which you will find the entrance to Clayton Hill Country Park which lies to the South of Nazeing Road. The club's water is located in the Lee Valley Country Park at Clayton Hill, Nazeing, on the Herts/Essex borders. 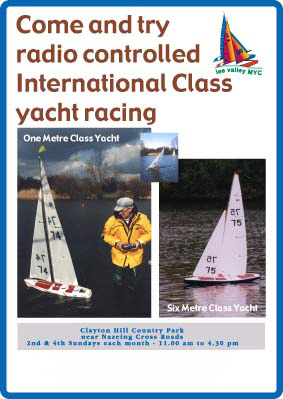 The Lee Valley Model Yacht Club was formed in 1990. For the first few weeks the original Gang of Three who founded the club met at the model boating pond in Harlow, Essex. 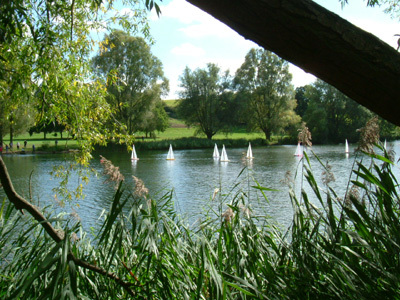 In August of 1990 a contract to sail at Clayton Hill Country Park was negotiated with The Lee Valley Regional Park Authority. Since then the club has thrived and currently boasts around 20 members. The club sails International One Metre yachts on the second and fourth Sundays in the month and Six Metre yachts on the third Sunday in the month. Beginners and visitors are welcome at any time. A personal handicapping system (The Rygged Start) is used extensively throughout the year to encourage newcomers to join in the racing programme: some races are however sailed as scratch races. The system has now been in use for over 8 years and has produced more than one international standard sailor. The sailing water is accessed from Station Road, Broxbourne - entrance close to Nazeing Crossroads and marked Clayton Hill Country Park (see map) - Lee Valley Regional Park Authority. 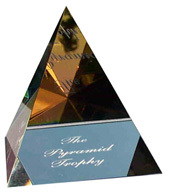 The Pyramid Trophy. The Lee Valley club encourages its members to practice competitive racing skills by meeting with members of other clubs in preparation for them entering 'open' competitions (if they wish). To enable them to 'hone' their racing skills in a friendly, non-threatening environment the club meets with members of the Three Rivers club twice a year to compete for the Pyramid Trophy. Team racing is the order of the day, so no one need feel under too much individual pressure. The competition has been a great success for a number of years.